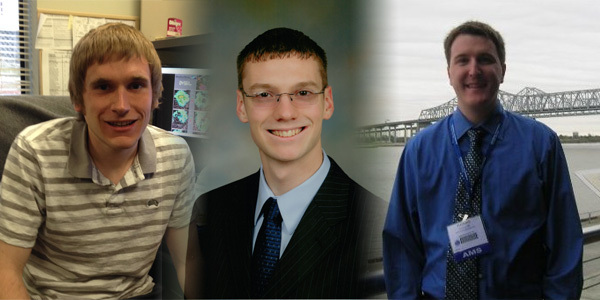 From left to right: Meteorologist Brian Marmo, Meteorologist Brian Clavier, and Dr. Tom Collow. Over the course of the winter, many of you have likely consulted with a few new meteorologists, both of which are named Brian. Meteorologist Brian Marmo is orginally from Long Island, specifically Babylon, NY. He graduated from Cornell University with a bachelor's degree in atmospheric science. Later, he attended Rutgers University, attaining a master's in atmospheric science. Brian Clavier's hometown is in New Holland, PA and he studied at Penn State University. There, Brian attained a bachelor's in meteorology with a minor in military studies. He also worked for the Campus Weather Service and was involved in ROTC for two of his years at the university. Finally, we would like to congratulate our weekend warrior Tom Collow. He has been with us part-time over the past 2 years, while diligently working towards his doctorate in atmospheric science. Tom has successfully defended his thesis on the interactions between soil moisture, vegetation and convective precipitation development over the Great Plains. He will be taking on a new position associated with NOAA's Climate Prediction Center, where he will be researching the effects of the Madden Julian Oscillation and ENSO in the Climate Forecasting System Model. We wish Dr. Collow all the best in his future endeavors!